According to the Center for Disease Control and Prevention, around 8000 snakebites are recorded on a yearly basis in North America alone. Thanks to an improvement in preventative measures, an increased awareness of effective first aid strategies, and current antivenom treatments, deaths are limited to roughly 5 per year. Heading out on the trail? We’ve put together a simple (but effective!) infographic that goes through the steps you should follow to identify, prevent, and, if necessary, treat a snake bite. What About Snake Bite Kits? If you’re taking a hike or going on a camping trip with your friends, the last thing you want is your journey to be cut short by you or one of your friends not being able to identify a venomous snake and falling victim to its deadly bite. All in all, North America is home to over 20 different species of venomous snakes, coming under four main categories: copperheads, coral snakes, rattlesnakes, and cottonmouth.Considering most snakes are not venomous, it pays to know which pose a danger. The differences can sometimes be minuscule, so remember the unique identifiers if you can. You’ve heard it before: ‘an ounce of prevention is worth a pound of cure’. While not always avoidable, there are several preventative measures you can take to minimize the chances of a snake bite. The first thing we recommend is that you research the area you’re adventuring. Once you know which snake species will be there, you can take the right precautions. A simple understanding of snake behavior will also help you. Snakes love to hide under rocks and logs, so make sure that you are careful where you step. They enjoy staying hidden in long grass, where there is little danger for them. Remember: snakes don’t attack unless provoked, so avoidance is usually your best tactic. If you’re the unfortunate victim of a snake bite, don’t panic. It’s very likely that it won’t lead to any adverse health issues or death, so follow our simple steps, and you’ll give yourself the highest chance of survival. As well as understanding snakes, you can wear protective clothing like the best snake chaps, snake proof boots, and snake gaiters. Clothing to prevent snake bites gives you peace of mind you when you’re in snake territory. If you’re handling snakes, it is absolutely advisable that you invest in bite-proof gloves. Although wearing these are super effective in stopping a bite, you still need to know a bit more about avoiding snakes altogether. Another common place to be bitten is your hand or wrist. 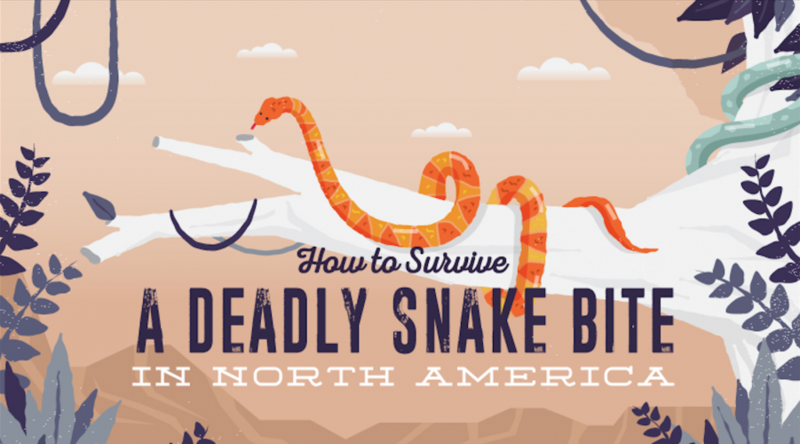 We also wrote an in-depth guide on how to prevent a snake bite, which is a good starting point for those of you that aren’t acquainted with basic preventative measures. Snake bite kits are thought of by many people as a home remedy for venomous snake bites. Essentially, a snake bite kit is a suction device which is designed to extract the venom from the wound. Unfortunately, research shows that these snake bite kits are ineffective in removing venom from bite wounds. Medical experts are in fact concerned that people may use these devices in an attempt to avoid treatment costs. Our advice? Always consult a medical professional and steer clear of snake bite kits. They’re not only ineffective, but they’re also potentially dangerous. In fact, medical research shows that the extractor devices remove almost no venom at all and, in some cases, can cause more harm than good. This is primarily due to the suction concentrating the venom in one small area and damaging tissue. No, we’re not talking about the kind that you keep in an enclosure; they’re known as pets and require all sorts of loving care, like decent bedding! We’re talking about intruders. Although they like to keep themselves to themselves, snakes can make their way into your backyard or even home. It is important to recognize that they’ll do very little damage, if any, compared to the likes of rats and mice. That said, they do of course pose a threat to children and animals, especially if venomous. If you find a snake is inhabiting your garden, you have a few courses of action. The most recommended way of dealing with it is to call a professional removal service. Many other people invest in humane snake traps, which are designed to lure the snake in and catch it unharmed. When using a snake trap, you should place it where the snake tends to linger and wait for it to be caught. With devices like glue traps, there is no guarantee of catching anything at all. Animals are unpredictable and can move on at their own will. One of the more controversial ways to deal with snakes in your yard is to use snake repellent. The effectiveness of any snake repellent is heavily debated, with most official reports suggesting that they are ineffective. That said, there are countless people who praise the success of using such products, which is why it is still relatively undecided. If you’re getting more serious about snake removal, or even snake handling, then you should absolutely invest in a good pair of snake tongs complimented by a snake hook. These allow you to keep your distance from the snake while maintaining control over its movement, keeping both you and snake safe from harm.